I'm at the KM4Dev workshop in the Netherlands. It's a beautiful location and a really great group of people. And I feel so at home at a place which bans Power Point, Word documents and Flip charts. But it's the third big event in amonth and I'm sorry not to have more time to pause and reflect inbetween. I have set up a KM4Dec2007 blog for this event and a blog for the Knowledge Expedititions workshop. As I got news of the four star hotel in Brussels and the finest hotel in Leeds, where I'll be staying courtesty of event organisers, I remembered the days when my friend/co-author and I stayed in the cheapest, most grotty places in Barcelona, Brighton and elsewhere - just to get our work heard. So determined were we to find people to listen to our ideas that we would walk for kilometers to a cheap residence, unpack our sandwiches on a single musty bed, and plan the final details of our presentation for a conference the following day. The first conference we went to was in Porto. We took the night train so we wouldn't have to pay for a night in a hotel. We sat upright on second-class seats, unable to sleep as it jerked to a stop at every station between Lisbon and Porto. We arrived In Porto at 4 in the morning and walked about until a café opened ninety minutes later. I remember it was cold. Later we found a more salubrious café (now MacDonalds) where we washed before making our way to the University, taking it in turns to carry Sally's heavy portable computer. I also remember how pleased we were with the paper we presented at that conference in Porto. And how criticized it was by the audience! It didn't deter us though. Neither that or our miserable Portuguese salaries as we found more conferences to go to in Europe. And now, many, many conferences later, people are listening. And, thanks be to the lord, the hotels are getting more comfortable. Today was a special day for a number of reasons. I presented at a seminário at Universidade de Aveiro alongside Betty Collis and Marina McIsaac. My work has been (and continues to be) quite invisible in Portugal so it feels good to know that some of the seeds I've sowed and nurtured over the years might grow into flowers. I paid homage to Sally Mavor, my co-author, best friend and whose son I adopted when she died. We were so inspired by Collis and Moonen's book "Flexible Learning in a digital world" that came out in 2001. Sally would be so tickled to know that I had presented at a seminar with Collis (and Moonen in the audience) at Aveiro, where she too was starting her doctorate. Like I said to Mavor-then-Trayner's son, there's no knowing what's going to happen in life. It's also what I told him after my lunch with Alvero from FRELIMO. In those days we were a minority rewriting the story about apartheid, Southern Africa, and "terrorists" like Mandela. It all seems quite normal for his generation now they are living in that re-written story . But ... it wasn't always like that! There have to be some people who are prepared to author the next chapters. A similar sort of question came up in the seminário. 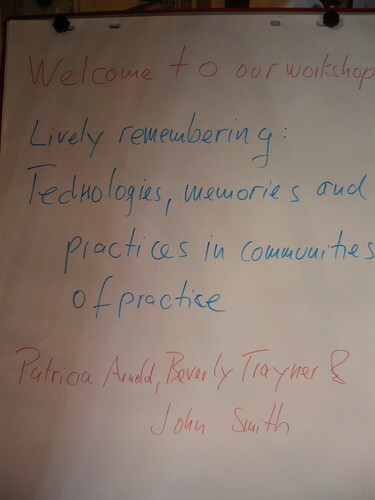 It all seems like a good idea but it all seems too difficult to think of communities of practice in Portugal. "No-one" seems willing to take risks, assume service leadership roles or look for ways to contribute rather than take. Like I suggested in the seminário, and like Marina said to me at lunch, if you persist in taking decisions based on what you are passionate about and what you think is right, then one day things will fall into place. I was inspired to meet Marina, a woman with a history of learning and pioneering to draw on for her encouragement, sharpness and wisdom. It was an oasis from my professional world where people emphasise outcomes, clarity and a focus on domain. And where you get your importance from talking, not listening! Our setting was a run-down guesthouse with a fabulous roof terrace and view over the city of Florence. We shared rooms, bathrooms and kitchen duties, with those elements as important as that of talking about the domain. The way that Etienne Wenger looks to be transformed by conversations. He listens and lets himself be transformed by them. The way that John Smith notices the small details in what people are doing and saying and weaves them into the bigger story, bringing in small things that make big differences. Patricia Arnold's continuously open and curious stance, living the paradox of certainty when everything is uncertain. I also have something to learn from her attention to detail. The care Marc Coenders shows people, his capacity for listening and the way he puzzles and learns from people's stories. Shawn Callahan's there-ness and capacity for listening and reformulating and reconceptualising what people say. Ueli Scheuermeier's independence and self-contained-ness. The way he self-organises and just does it. He also packs a very small suitcase that I aspire to. Derek Chirnside's positive outlook on practices and his dexterity in picking up the ball and running with it. The way Andy Roberts both engages fully and maintains his independence; he seems to be able to maintain objectivity and subjectivity at the same time. The domain elements of what we talked about and learned from each other are coming up in the next post. I was and wasn't at the SHiFT conference duing the last couple of days. During the two days at the conference in Lisbon I was also trying to get the water board (in Setúbal) to come and see why I had NO WATER AT ALL in my house. To cut a long and stressy story short they did finally fix it this Saturday morning, but I've been three days in an appartment without water - with the prospect of waiting until Monday to get it fixed. My chance to contribute to social and human ideas for technology thrown out the window by social and human incompetence! meeting people whose blogs I read but haven't met. While my mind was at SHiFT I was with people who gave slick presentations, who could make you feel like a retard if you didn't have a Mac, and in whose universe "everyone uses RSS feeds". I'm OK 'cos I have a Mac and have RSS feeds for breakfast, but in the real world I inhabit very few people / no-one uses RSS feeds, blogs or Web2.0 technologies. I did worry about the gap between those people who are working on ideas for technology and those people who are looking for technologies to support social and human ideas, especially those ideas which are outside the technology loop. How do you bring a political, critical loop into conversations at a conference like this?